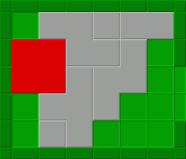 These sliding puzzles consist of a number of gray pieces and one red piece in a green "room". The "room" has a light green floor and a dark green wall. The wall has a single exit. The aim of these sliding puzzles is to get the red piece in front of the exit.